Are you the type of bride who like the styles from the past? Then a vintage wedding dress is what you need. Where can you find these dresses? There are websites that sell them and designers that create the designs. Some designers' vintage wedding gown collections can only be purchased directly from them . Others have their collections sold only at bridal shops. You can also purchase these gowns from online bridal shops. Why not have a vintage gown for your wedding custom designed for you! You can look for a local wedding dressmaker to create a vintage style wedding dress for you! There are vintage wedding gown patterns that your gown can be made from. Some dressmakers have design skills which means they can work from pictures or sketches that you provide. If you can't find a local wedding dressmaker to work with, you can also design your own wedding dress online at sites that will do custom wedding dresses from your picture. You can send them a picture and description of what you want, and they will create the gown for you. "I like the above wedding gown! It has clean lines and classic details which were prominent in the 1960's and 1970's. It's a-line silhouette is great for most body shapes. Great dress for a mature bride who likes a sophisticated look!" Here are some resources you can check out! 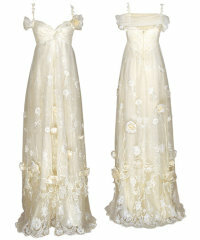 One of my bridal alterations customers gave me this designer Claire Pettibone. She has beautiful vintage bridal gown designs.. This site The Vintage Wedding Dress Company has their wedding dress designs broken down into decades. Stephanie James Couture designs beautiful lace vintage dresses. Just take a look! Here is a source with lots of dresses to choose from! Check out UniqueVintage to find your perfect wedding dress! This site Blue Velvet Vintage provides a list of resources about finding and wearing vintage clothing. The above wedding dress has that modern vintage style with a romantic flair. The ruffled tiered skirt and the pink bow accent makes this style ultra feminine. This 1950's full crinoline tea length skirts is perfect for you if you want to go back to that time era. You could use it as your wedding dress or use it as your second dress to change into for the reception. This flapper inspired dress is a show stopper. It's fun, and unique! No matter if you are a young bride or a mature bride just about anyone can wear this dress and look great!